This chicken yogurt curry is a delicious and easy meal great for easy weeknight meal or weekend entertaining. A healthier curry, made using whole ingredients, you’ll love the freshness of this recipe! This post was sponsored by Nancy’s Yogurt. As always my opinions are my own. Thank you for supporting the brands that make THCK possible! Happy Wednesday! And happy March! Does that mean Spring is on its way?? I am SO excited to bring you this recipe for this most delicious Indian chicken yogurt curry! 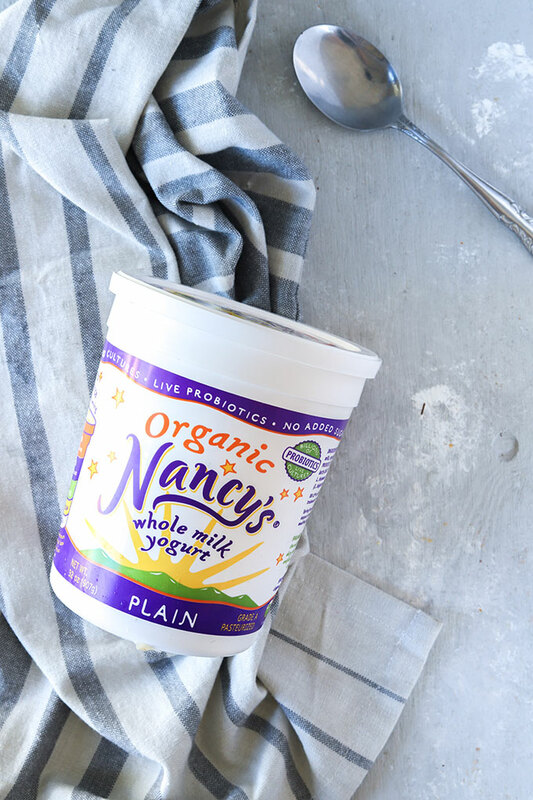 And even more excited to be partnering with Nancy’s Yogurt for this post! This Indian style chicken curry is omgeee good! Slow cooked chicken, in a rich tomato spicy sauce – are you drooling yet? Made better by the fact that it’s lightened up using my all time favorite Organic Whole Milk Yogurt from Nancy’s! 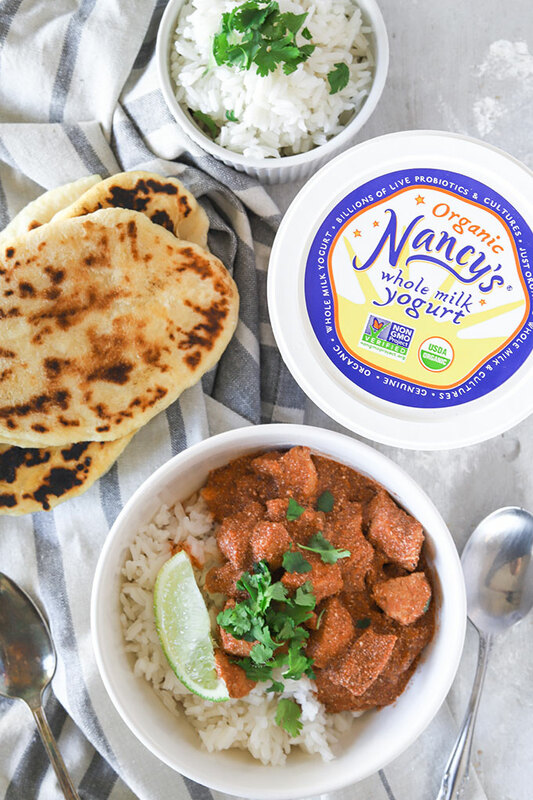 Nancy’s Yogurt is an Oregon based, family run company that provides the most delicious dairy products such as their yogurts, kefir, sour cream and cream cheese. Not only do they provide amazing dairy products, but they also pride themselves in using real ingredients in their products, which is something I can definitely get behind! I love using products that I know follow sustainable practices AND are good for your health! When Adam and I first moved to Portland we were looking for local products that we could use on a regular basis, and Nancy’s was one of the first yogurts we picked up to try. Needless to say, we use Nancy’s on a day to day basis in our household! The organic whole milk yogurt I used for the chicken yogurt curry takes the curry to the next level. I wanted to make a curry similar to a butter chicken, but without all the heavy cream that is traditionally used, so opted to substitute the heavy cream for the organic whole milk yogurt. 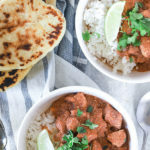 The yogurt makes this curry as creamy as it would if you used heavy cream and I love knowing that it is just that little bit healthier for me! So it’s kinda like a healthier butter chicken! You with me? This Indian style chicken yogurt curry is light, fresh and has the most beautiful spice blend to it, without being overly heavy on the chili. The freshness of the lime adds an extra element of freshness to the dish and as mentioned, this curry is oh so creamy from the organic yogurt. Adding the yogurt – slowly add the yogurt OR add some of the hot liquid bit by bit into the yogurt before pouring back into the slow cooker to avoid curdling. Don’t have a slow cooker? This can easily be adapted to a stove top. See recipe notes below! 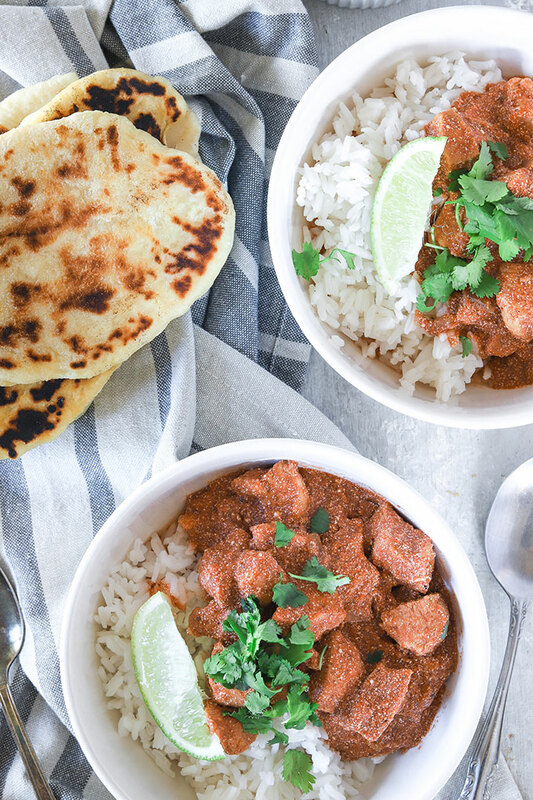 Serving – serve with fresh cilantro, lime wedges, jasmine rice and my go-to naan bread. It’s perfect for an easy weeknight meal (hello slow cooker) or if you’re looking for a cozy meal for easy weeknight entertaining. Regardless of the occasion, this curry is extremely easy to make and bursting with flavour. 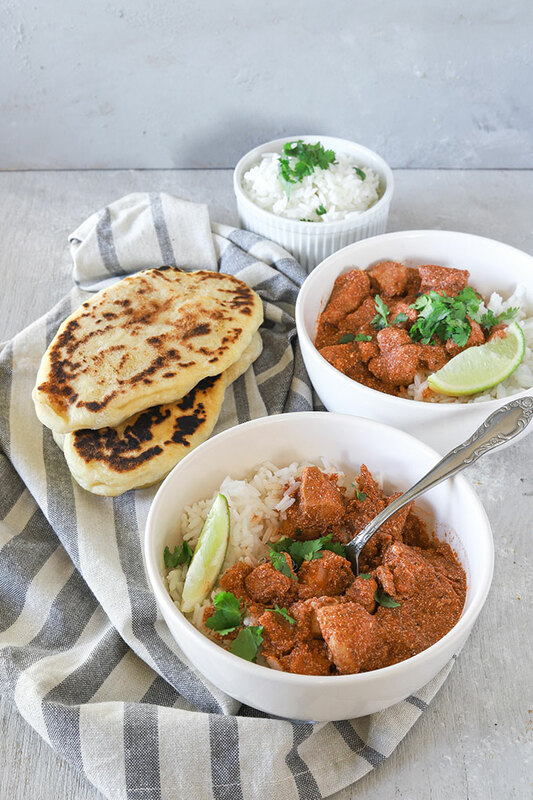 A beautiful curry for a weeknight meal or weekend get together with friends, this slow cooker Indian style chicken yogurt curry is fresh, healthy and bursting with flavor. Place spices, salt and pepper, onion, garlic and passata in a slow cooker and stir until well combined. About 20 minutes before serving, slowly add about 1 cup of hot liquid, bit by bit to the whole milk yogurt to slowly warm it up and prevent curdling. 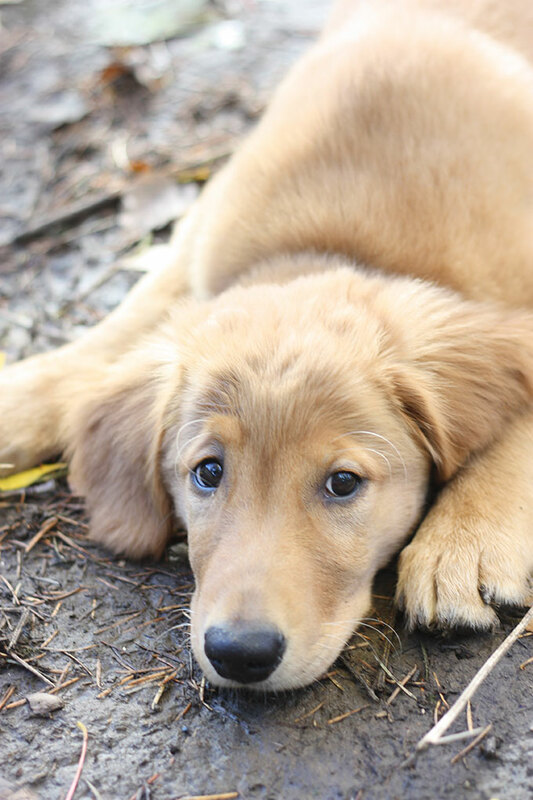 A throwback to baby Archie! OMG he was so tiny!!! Now he’s a 65lbs boofhead who steals sticks from toddlers! Isn’t it great!! I keep forgetting you grew up in Oregon 🙂 THanks for the love Kelsie, give Cookie a pat back for me! I’m also a huge fan of Nancy’s Yogurt – I always loved the single serve cups with the fruit packet at the top – SO good! This Yogurt Curry Chicken also looks amazing! their products are so good! thanks Erin!! Thanks Kelsey! passata is really easy to find, its basically a tomato sauce (not ketchup)! you could also use a can of crushed tomatoes! Thanks Megan! i probably have curry at least once a week ha ha we love it! Yummers! You and I were on the same wavelength this week: CURRY! 🙂 My post this week has a curry soup. I also love anything that is in the slow cooked. Perfect weeknight dinner! Thanks a bunch! ooo curry soup sounds great! yeah i accidently did two curry posts in one week ha ha oh well, curry is so good we need more of it in our lives!